On the night of the 24th April 1914, 14 vehicles set off in great secrecy to Larne Harbour to pick up a shipment of guns landed from Hamburg. 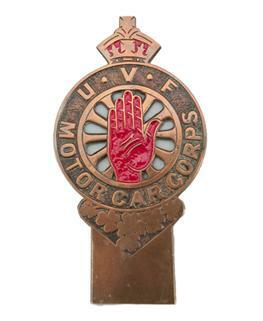 Of the 30,000 rifles to be landed that night, 1000 had been allocated to the North Antrim regiments of the UVF. Those supplying cars to collect the arms included the Reverend Clarke of Connor, the Young family from Galgorm Castle, the Wilson family of Raceview amongst others. Kane’s Foundry in Ballymena supplied a lorry which carried 125 rifles and ammunition back to Moorfields. The night time operation was a success and the guns and ammunition were distributed throughout Ulster. Why do you think the drivers of the vehicles involved in the gun running were supplied with a special badge?